"With this hand, I will lift your sorrows. Your cup will never empty, For I will be your wine. With this candle, I will light your way in darkness. With this ring, I ask you to be mine." Wow, this is so accurate! Not to mention pretty! 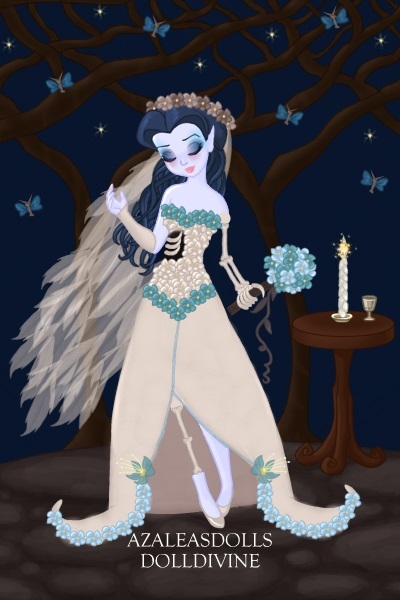 I love how you made her partially skeletal, and her dress! I love this! Such good use of the D&D. Thanks so much, pigobest! @PinkRobin, TY, you're too kind! @skeletonkilljoy, so the # of votes allowed increases when people click 'view doll'? Congratulations! You won the third place in my contest "The best of the best!" in "Accurate" category! Really resembling! The dress, the bony arm, the bouquet, the make up and especially the veil! Everything is perfect! Lovely also the idea of the braid as a candle! Good job! @LadySky the votes will increase becase poeple will open the 'view doll' link in a new tab to see the doll they are voting on, but some poeple don't do that..
congrats on first place in the hall of fame!!!!! Thanks, Soph! It's one of my favorite movies too!